When you welcome a child into your life, you bid farewell to a few other things in the very same breath: sleep, free time, and perhaps most obvious of all money. Kids cost lots and lots of money, partially because parents are motivated by guilt and societal pressure to provide the very best of everything for little junior, and partially because kids grow and change so darn fast, you’re practically buying them an entirely new wardrobe with every (dwindling) paycheck. Of course, the constant cash drain is all just part of the deal when it comes to raising little adventurers, and it’s truly a small price to pay when it comes to the joy you get in return when you share your life and interests with them. So when it comes time to take your kiddos with you on the trail, you want to smart with your spending. How can you be sure you’re outfitting your babe with the best toddler hiking shoes without blowing your budget on unnecessary expense? Well, we’re here to help you with that. As your common sense likely tells you, the checklist you have in mind when you go shopping for a pair of hikers for yourself is pretty similar to the one you’ll need when it comes to buying baby hiking boots — with a few nuances, of course. Fit is always a huge consideration when purchasing boots, and this goes double for little ones whose feet are constantly growing and developing. Babies usually have flat feet when they’re brand new, and the rapid growth they experience in the first few years can lead to issues when it comes to footwear. If your child requires special orthotic inserts in his shoes, you’ll obviously want to take this into consideration when you’re sizing his boots. Of course, choosing the right size of toddler hiking shoe isn’t going to be an exact science by any means: you’ll want to pick a size that allows for a bit of room to grow (and room for socks), but you still want to ensure that the boot fits snugly to your child’s foot. A loose fitting boot is a recipe for injury on any hiker, especially the littler ones with less experience and balance control. Make sure you’re child’s boot fits at least to the ankle but not higher than the calf to allow for optimal freedom of movement. Chances are you’re not planning on taking your toddler up the side of Mount Everest, but you do want her shoes to be able to handle rough terrain. Look for a well insulated boot (if you’re planning on winter wear), as well as a soft, flexible sole and deep treads for solid traction. And while we’re on the subject of water repellent, you definitely, no exceptions want a boot that is 100 per cent waterproof. Even if you’re not planning on any rainy day hikes or hikes that bring you even remotely close to any bodies of water…kids will find a way to get their shoes wet, and that’s a fact. If you have even one day of parenting experience under your belt, then you will laugh anyone out of the room if they try to sell you something that isn’t washable. Kids are capable of making messes you never thought humanly possible, so choosing a fully washable boot is just plain smart all the way around. Thinking of your child’s comfort is truly instinctive for parents— you’ve been swaddling your babe in the softest blankets and clothes since day one, and it should be no different when it comes to hiking shoes. The shoe you choose should have a smooth lining, substantial padding, and a soft, thick collar. If you choose a leather boot, you might opt to apply an extra coat of water repellent wax to soften the leather and make the shoe more supple and easier to break in. Quite often, durability goes hand in hand with price, which goes hand in hand with quality craftsmanship and construction. This isn’t to say that the best baby hiking boots are going to be the most expensive, but it does mean that you should be prepared to pay for a brand and materials that have proven to stand the test of time on a toddler’s feet. Kids are harder on shoes than you might expect, and you don’t want to be returning to the shoe store for a replacement pair of hiking boots until your kid has fully sized out of her current pair. This section is going to be short and sweet, but the message is an important one: DO NOT let yourself fall victim to the siren song of designer kids footwear based on the brand or the look alone! Kids’ shoes are adorable, no doubt, and we’ve all oooh-ed and aahhh-ed over the tiny little boots in the shoe section that look just like ours only teensy! They’re adorable, yes, but adorable doesn’t always mean functional, and it certainly doesn’t mean affordable. Stay strong when it comes to resisting the temptation to outfit your tyke’s tootsies in a boot you’ve chosen for the cute pattern or brand name alone. Yes, it might make you feel like the most stylish parent on the block to have a kid rocking an tiny pair of Timberlands on the trail, but the bloom will fall way off the rose when those same little bewitching kicks give the little guy blisters for days or contribute to an otherwise avoidable slip and fall. Also, if you’re planning on taking your kid on some serious hikes and shaping her into a serious adventurer, don’t be shy about investing in a good pair of boots. Yes, she’ll probably outgrow them by the time the seasons turn, but you can always hand them down to younger hikers, or if they’re still in pretty good shape—sell them to a secondhand store to make some of your money back. If you’re on a tight budget (what parent isn’t? ), you can find other ways to cut corners when it comes to your kids’ gear (chances are she doesn’t really need that $89 merino wool base layer), but don’t skimp on the boots! Your child’s feet will thank you…and so will your child. 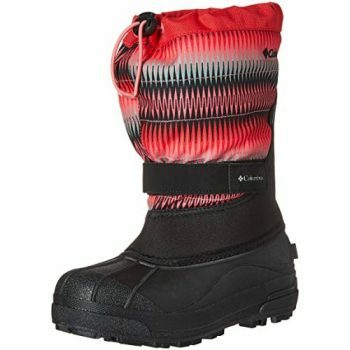 The lightweight Kamik Footwear Snowbug3 Boots are designed specifically to keep little feet toasty while rambling along the winter snowscape. Made of all recycled materials, this eco friendly boot is vegan and features a fully waterproof nylon upper with a fashionably cozy faux fur lining. An adjustable elastic strap provides a fully customizable fit that can move and grow with the wearer. These extra wide gaiters are easy to get on and off squirmy little hikers, and the synthetic rubber shells won’t weigh down the foot. The Kamik line of footwear is known for its exceptional design when it comes to cold weather conditions, and these little wonders are no exception. This boot comes highly rated by parents, who report a snug fit, reliable water resistance, and unmatched warmth. Users also say that this boot is truly kid friendly when it comes to little adventurers being able to put them on and take them off with ease. The Keen Chandler CNX Shoe is a solid choice for active kids who hit the ground running and require the best in support, protection, and traction. 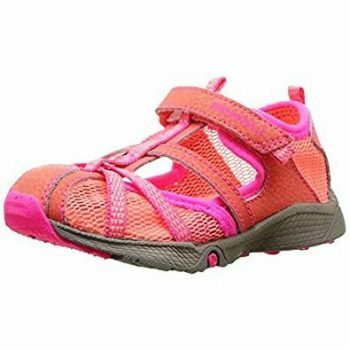 This lightweight shoe in constructed of breathable mesh and synthetic materials, and will keep little feet well ventilated and comfortable with its synthetic, moisture wicking mesh linings. The quick and easy single pull lacing system makes getting ready to go a breeze, and provides a close, secure fit each and every time. The shoe’s reverse strobel construction gives it a streamlined inner fit, and the heel and tongue loops ensure that there will be a minimum of yanking and pulling when it’s time to take them off at the end of the day. These quick drying shoes have ample traction, a cushiony soft EVA footbed, and toe bumpers to protect against painful stubs and bumps. They’re sure to be a durable hit on the trail as well as on the playground or the park. Related: The KEEN Versatrail Shoe is a breezy warm weather canvas upper with easy on and off fit and adjustable hook and loop laces. 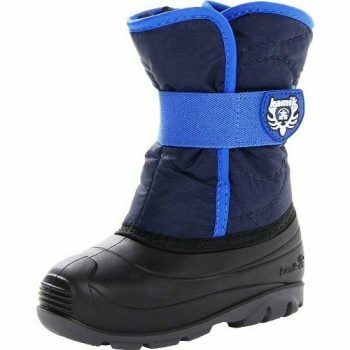 The Orgrimmar Children Snow Boots are a great all purpose snow boot that has all your bases covered when it comes to keeping little feet warm, dry, and comfortable. A warm, plush inner lining provides comfort and heat retention, and the handcrafted, water resistant design ensures that socks will stay dry no matter how long your kiddo stomps around in the snow and slush. Parents report that kids were able to get these boots on and off with ease and could adjust the velcro strap themselves, although some said that the snug fit necessitated ordering a size up, especially when it comes to accommodating for thick winter socks. Some parents said that while the boot was fully waterproof on its own they benefitted from applying an additional coat of water repelling spray as extra insurance, especially in extra sloppy weather and/or after the boot had already endured several rounds of puddle stomping. The sterling reputation of KEEN footwear is alive and well with this solid and well crafted boot. Lined with KEEN’s signature breathable membrane that keeps feet warm but not sweaty, these KEEN Basin WP Boot feature internal pull loops and a snug bungee lace capture system to make suiting up a snap. A cozy fuzzy cuff ensures that no snow will sneak its way down the boot shaft, and the dual climate non marking rubber outsole makes them indoor friendly when they need to be. These fully weatherproof leather and textile boots can be easily spot cleaned with leather cleaner and conditioner to keep them looking equally as great as their performance. These boots are a great choice for a whole winter’s worth of outdoor adventuring, and users have been overwhelmingly impressed with the durability of this boot, which can be expected to survive several generations of hand me downs. Related: The KEEN Kelsey Boot WP Shoe is made to handle winter weather with aplomb, and these snazzy waterproof numbers feature a convenient side zipper for easy on and off. Specific features: Synthetic upper with a quick dry lining, non marking outsole, molded EVA footbed, M-select grip traction, M-select odor prevention, and adjustable closures for a snug, safe fit. Best use: This shoe is fully ready for a puddle filled day at the beach, river bank, or water park. The Merrell Hydro Monarch Water Shoe gives parents all they could ask for in terms of a safe, solid, and durable water shoe. 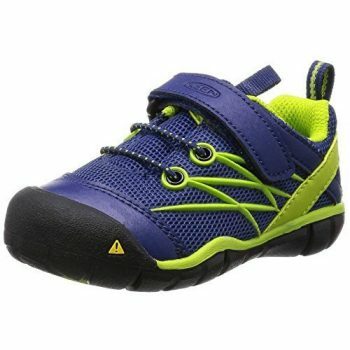 Your little one will be perfectly prepared for wet weather adventures thanks to the lightweight construction of this fast draining and quick drying shoe that offers a secure hook and loop closure and rugged outsole for ultimate traction. A protective toe cap keeps those little tootsie intact, and the soft, EVA molded footbed will fight off fatigue and provide all day comfort. The mesh ventilation gives this shoe full breathability and temperature regulation on steamy days when there isn’t a drop of water in sight. This fully amphibious water shoe pulls on easily with the help of a back heel tab, and the M-Fresh antimicrobial lining ensures that things won’t get funky, even after an entire summer full of rainy days, stream wading, water sliding, trailblazing, and puddle hopping. Related: The Merrell Hydro Rapid Water Sandal is a sturdy water sandal that provides the best in traction and antimicrobial odor control for your water loving little one. If you’re looking for a beast of a winter boot to help your kid dominate the outdoors this winter, look no further. The Columbia Powderbug Plus II Boot is virtually unmatched with its completely weatherproof nylon construction and insulation that is proven to keep feet warm down to a frosty -25F/32C. A fully removable and washable 6 mm felt inner liner is a smart feature designed to keep things fresh within the stink prone depths of the boot, and the adjustable elastic instep strap works along with the drawstring and barrel lock closure to provide a perfectly snug and customizable fit. 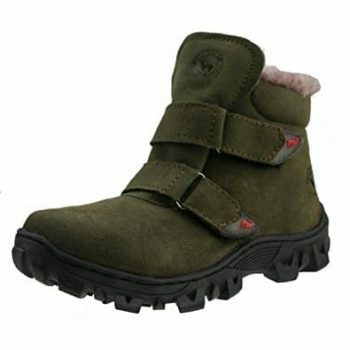 Despite being a heavy duty boot with all the desired bells and whistles, this boot is remarkably lightweight, keeping your kid’s feet supported, protected, but not weighed down as she attacks the winter wilderness with ease. Parents report that this boot tends to run a bit narrow in the footbed, and this combined with the high shaft—means that your child may need some assistance getting it on and off. When it comes to parenting, so much is luck, learning, and harrowing guesswork, but when it comes to finding a perfect pair of toddler hiking shoes, the wealth of options and information available make it easy to outfit your tiny trekker for adventures in any season, weather, and terrain. Do you have a brand or style of hiking shoes that have worked well for your crew? Or do you have any words of warning for ones that proved to be less than trailworthy? Share your expertise with us in the comments!